Thirty years ago we were seeing the dawn of 32-bit home computing with the state-of-the-art Commodore Amiga and Atari ST coming to market. The Amstrad PCW 8256 was also the exact opposite to these, and yet it turned out to be an enormous success in the countries it was launched in. Back in the 1980s, wordprocessing was one of the most common things you’d do on a computer. Email and other online services were rudimentary and only used by a tiny handful of people, so things such as business correspondence were sent on bits of paper. If you wanted to use something better than a typewriter, then you’d need a word processor. These tended to be expensive, or very difficult to set up. Or usually both. But the Amstrad PCW tackled both of those problems head on. As with the Amstrad CPC range, the PCW was a combination of very cheap components cleverly packaged together. Based on a Zilog Z80 processor with 256Kb of RAM, and running the CP/M operating system (both designed in the mid 1970s), you could hardly call the PCW a high-tech device. The package included a monochrome monitor, keyboard, one or two 3” floppy disks and crucially it came with a basic dot matrix printer in the package. With the possible exception of the floppy disks you had to buy, none of these components was very expensive, and this enabled the PCW to sell for a little over £450 (equivalent to about £1240 or €1700 today). This was a fraction of the price of (say) an IBM PC with similar capabilities. The other advantage of including everything you needed in the box was that everything worked when it came out of the box. You didn’t need to worry about compatibility, or drivers.. or really anything else, because everything was designed to work together. The PCW can be regarded as an “appliance” in the same way that contemporary Macs could. The LocoScript word processor was basic but straightforward to use, but because the PCW ran the CP/M operating system, it could also run a variety of other business applications such as spreadsheets and databases. And although the PCW wasn’t designed for games, inevitably there were those too. Most of the circuitry to drive the printer was actually in the computer case, and the printer itself was very simple and the 9-pin head could only really produce rather chunky text. The printer itself was highly proprietary, so you couldn’t simply upgrade it to anything except an Amstrad daisywheel printer or Amstrad plotter. However, you could produce simple graphics with the standard printer which did lead to some basic desktop publishing (DTP) packages being developed. 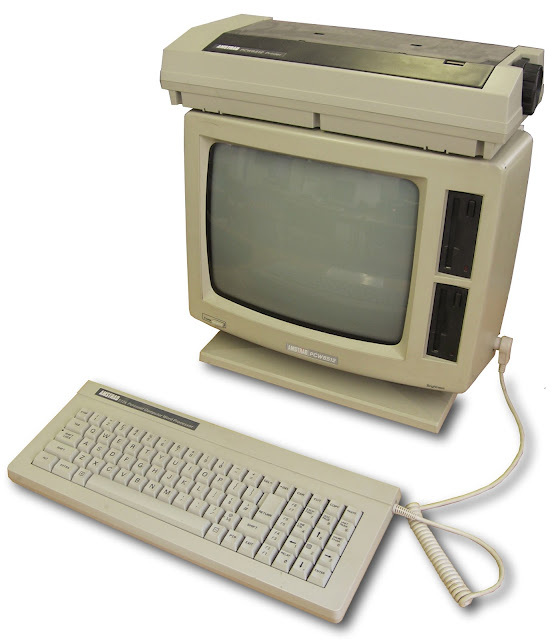 A few months later the Amstrad PCW 8512 was launched with twice the RAM. In 1987 the PCW9512 and 9256 were announced, replacing the crude dot matrix printer with a daisywheel printer. In one form or another, this series of computers soldiered on into the 1990s by which time they had sold 8 million units. Not bad for something based on 1970s technology. If you are looking at starting your own computing museum, then the Amstrad PCW is a very cheap thing to acquire, commonly available for about £10 to £15. An original 1984 Apple Macintosh will cost about fifty times as much!